Braise, Boil, Bake | Life in my little kitchen, one bite at a time. Life in my little kitchen, one bite at a time. 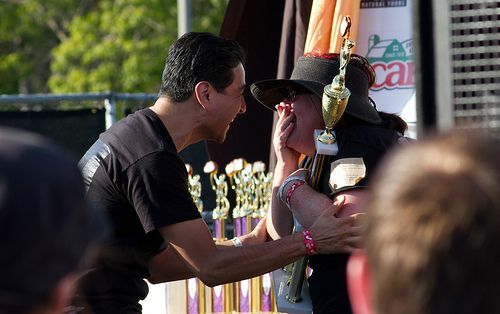 When I heard that this year’s Grilled Cheese Invitational was going to be held at the Rose Bowl, I kind of freaked out. I mean, being a lifetime resident of Los Angeles, the Rose Bowl holds a certain aura: it’s the arena where legends have been made, where epic concerts have been held. 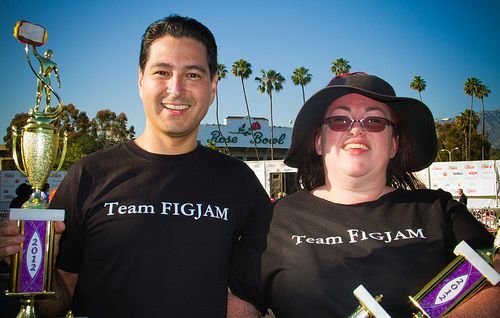 Sure, the event was being held in the parking lot, but… it was still the frickin’ Rose Bowl! Now, if you’ve been around me long enough, you know one of the things I live for is this competition. My first one was four years ago, and I was hooked. 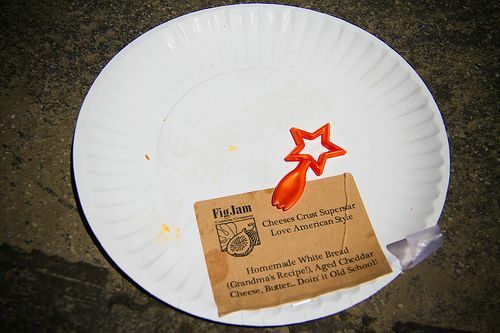 Sometime around January, my idle thoughts will turn to grilled cheese, long before they set the date for the event. My friends are tortured by my constant ideas about what I could stick between two pieces of bread that would make a winning sandwich; I subject them to rounds of tastings, trying to pull out opinions of how to make my ideas better. One of my best friends, Moris, supplies me with all manner of cheesy puns to use for naming my creations. This year was going to be different. The past three years of walking away empty-handed gave me the experience of how to make good use of my time during the competition. I knew to print labels for my sample plates (no more “what’s in this?”) and I knew how to prep in such a way that my samples came out fast and hot. I was ready for victory. We arrived bright and early, ready to do battle in the first two heats. And when I say heats, I’m not joking. It was hot you guys. Talking to our neighbor for the first two heats, and we’ve got our game faces ON. When the spatulas dropped, we got to work. First up, we had our Love, American Style sandwich, Cheeses Crust, Superstar. It’s your classic grilled cheese: white bread, American or Cheddar cheese, and butter. I made my own bread, of course, with the recipe taken from my grandmother’s old Better Homes & Gardens 1960’s red-checkered cookbook. I’ll forgive my official photographer for not getting a picture–it was a good sandwich. We never got a picture of our Honey Pot entry, Lady Lemon Licker. And, if any of you fine folks out there who attended, if you got a picture, can you help a girl out? I was so focused on getting out my samples I forgot to get Choo to take a picture! 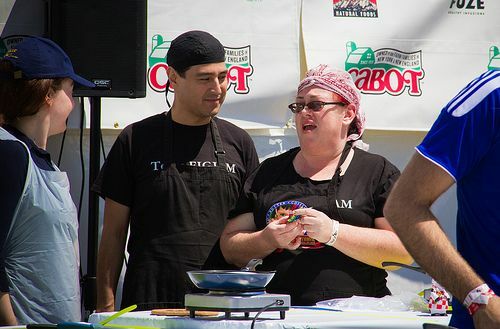 So, after getting our sandwiches out, we had several hours to burn and several friends who traveled from all over the country to come see me compete. And, not only that, these wonderful people made sure I was never without beer the rest of the afternoon. The time came to hear the winners. I waited near the stage; it was nothing new, we had done this before. I think this picture really captures it for us. And I’d say it was the beer, but I was NOT letting go of that trophy! Look it that! 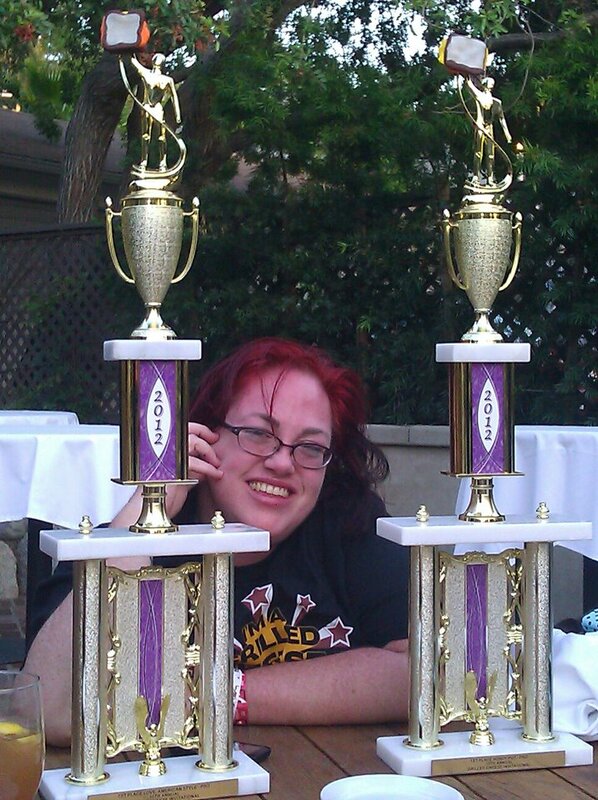 Trophies won! At the frickin’ Rose Bowl! 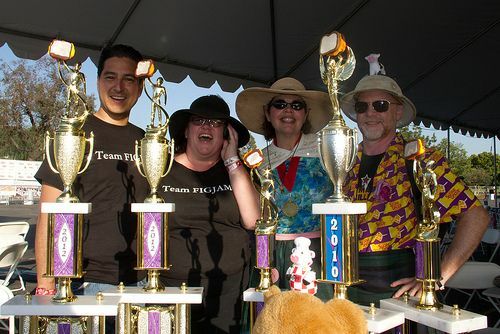 And there we are with our friends, Jodi & Sparky, who also won (2nd place Honey Pot, Spaz, and Frontiers in Fromage), and, YES, I’m on the phone with my mom! Who do you call when you win something like that? Mom, of course! I don’t think I made much sense, but she was happy for me. You know I’m coming back next year; I have more categories to win. 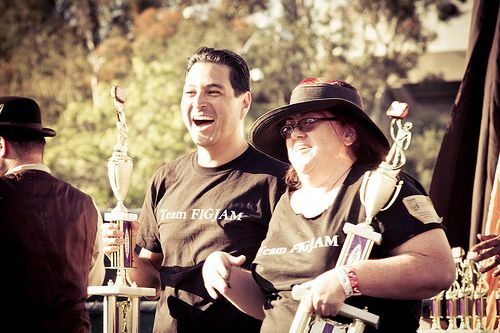 Team FigJam: in it to win it for 2013! David Schneider, my official photographer. You can see the rest of his pictures from this event here. Chris, who took the video of my wins, and his sister, Katie, who came all the way out from Atlanta! Margaret, my favorite co-worker, who showed up and screamed and cheered us on the entire way. Moris, Cristhian, Jodi, Sparky, Mike, and especially Jason, who even after I set his oven afire earlier this year, still let me do a test run in his kitchen without batting an eye; I’ve tortured you with enough grilled cheese to last you the rest of 2012. Jeff and Ange and their friends, who all were down from San Francisco and cheered me on, too. I have awesome friends. I attribute my win to you guys; you helped make it happen. Up at the crack of dawn, I spent this Sunday morning firing up the smoker for Turkey #1 (see last year’s smoked turkey). After all that, I wasn’t just hungry, but Tony Robbins Hungry. 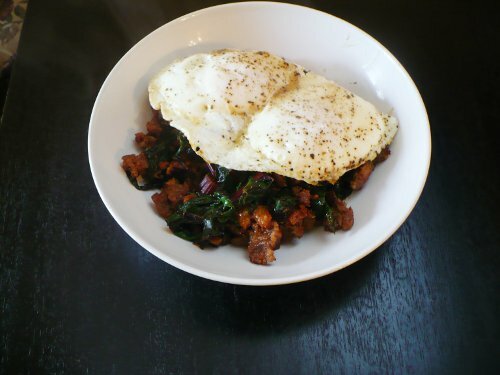 I needed a solid and hearty breakfast and I had a bunch of chard that needed to get used up today; this created a dish borne from necessity, and yet, it was everything I could have asked for in a Sunday breakfast. In a large skillet on medium heat, start to brown and crumble sausage. When sausage starts to brown and give off fat, add onions and bell pepper, cook until onions translucent, about 5 minutes. Add chard stems and saute for another 2-3 minutes. Deglaze pan with the stock, scraping up any browned bits in the pan. Add chard leaves and cover pan with a lid, turn heat down to low, letting chard wilt. Cook 6-8 minutes, stirring occasionally, until chard is tender; during this time, start to cook your eggs–I did mine basted, but you go on and cook your eggs however you like them. Season the chard sauté with salt and pepper to taste. Serve with the sauté topped with eggs. Buy a digital meat thermometer, preferably one that has a long ovenproof probe that you can keep in the bird while it’s in the oven. Stick that probe deep in the thigh, as that’s where you’re going to test for readiness. High Heat Roasting: heat that oven at 500° (yes, really) and once you put your bird in the oven, close the door and set the timer for 30 minutes. At 30 minutes, turn the heat down to 400, and don’t be tempted to open the oven door. Keep it closed unless you’re seeing the breast getting too dark–go ahead and cover the breast with foil if that’s happening. Pull the bird from the oven when the thigh reaches 161°. Poultry is cooked at 165°; when you pull the bird out a few degrees early, the carryover cooking that happens while the turkey rests will bring it up to temperature. Let it rest! 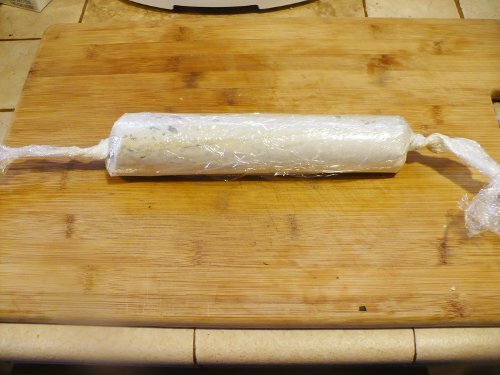 Loosely cover the bird with foil so it has a chance to finish cooking. Give at least 20 minutes to smaller birds (under 13 pounds), 30 minutes to the bigger ones. This gives the turkey a chance to finish cooking and for the juices in the meat to redistribute. Cutting it straight out of the oven releases too many juices and will dry out the meat. Don’t stuff it! Put a few things in it for seasoning such as half an onion, a few sprigs of herbs, a quarter of a lemon. But, a stuffed turkey means you have to make sure that stuffing also reaches 165°, and that can add more cooking time (which is exactly what we’re trying to avoid). I put butter under the skin of the breast; it’s a great way to add a little extra fat and flavor to the breast. 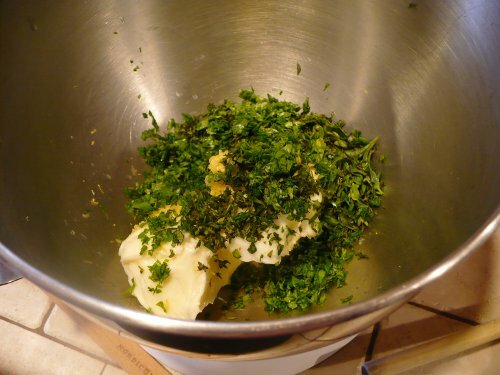 Using a compound butter–butter blended with seasonings and herbs–is easy and can be done well ahead of time. Compound butter is one of those nifty little condiments you can make and use to add tons of flavor with little effort. 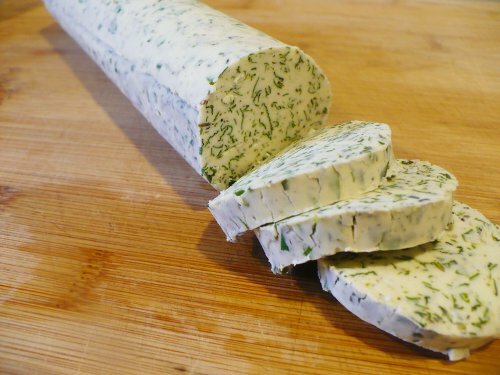 The big granddaddy of compound butters is Maître d’Hôtel butter; a little fresh herbs, some lemon, and a bit of salt and pepper make a butter worth serving on hot steaks in fancy joints. I’ve seen all kinds of compound butters popping up all over the place–from the basic lemon-herb to port-dried-cherry-bacon to chipotle-garlic. Let me show you how easy it is to make, and I’ll let you and your imagination go from there. Ready? With this batch, I’ve focused on the flavors I prefer with turkey–parsley, sage, thyme, marjoram, and savory. 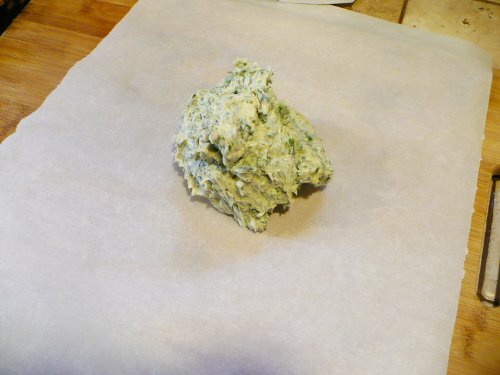 As a general ratio, expect to put about 1/4 cup of herbs to 1 stick of butter. Also in the bowl is the zest and juice of one lemon. I gave all of this a good beating using the paddle attachment in the KitchenAid mixer. See those little slices? They’re perfect for sliding right under the skin of the breast, where they’ll melt and season the meat as it roasts. Wasn’t that easy? Are you ready for Thanksgiving? How do you like to cook your turkey? You know how it is: you move to a new way of eating and you do your best to get the rest of your family on board. Now, once Choo started to see the changes in my health and figure, he quickly followed suit. Kiddo, on the other hand, has been a tough sell. I’m starting out slowly… changing peanut butter for almond butter; having him eat eggs for breakfast instead of cereal a few times a week; making his lunchbox treats with less flour and more nut and seed meals. One thing that’s been a challenge is replacing store-bought condiments with homemade; Kiddo isn’t fooled–he knows that’s not REAL ketchup. I feel like I’ve been lucky to have a kid that actually does like some vegetables, but he’s been asking for “sauce” (Ranch Dressing). 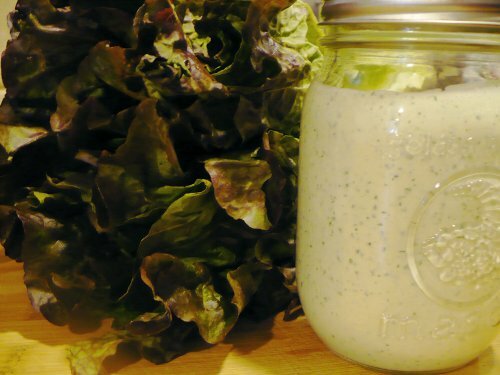 Now, have you ever seen the label on a bottle of Ranch? Yeah. I’m not going there ever again. I had some lebni leftover from a trip to my local Persian market, along with some fresh herbs and buttermilk, a whirl through the food processor, and I had a dressing worth putting on salads and dipping our carrots. This was quick to put together, and once put in a clean jar, will hold for about two weeks. In a food processor, add mayo, Lebni/yogurt/sour cream, lemon juice and garlic clove and pulse about 3 times to mix. Add fresh herbs, salt, and pepper and pulse until herbs are chopped. Pour in buttermilk and pulse again until combined. Store in glass jar or container. This past week, even though it’s still rather warm here in Southern California, I’ve definitely noticed the changes that mark the movement of Summer into Autumn. They’re very subtle, and someone who hasn’t lived here for most of their lives wouldn’t necessarily notice–how the morning air is just a few degrees cooler, the afternoon light tilts just slightly casting a warm glow across the skies, even though it’s still 85 degrees outside. With the seasonal nestiness kicking in, my thoughts have been moving to some of my favorite things to make–roasts, braises, and the like. Tonight, I made some last minute plans to have friends over for dinner, so I wanted some uncomplicated dishes that I knew I could put together easily–a Roast Chicken with root vegetables cooked in the pan; a salad… but what about dessert? Yes, even with living a primal lifestyle, dessert can and does come into the equation. The occasional sweet thing is not verboten, and with a little tweak here and there, you can make something spectacular. Here at El Rancho, I had a bag of pears sitting on my counter that needed some attention, and I KNEW what I had to make. Taking the firmest of the pears, they got the peeling and coring of their lives. A vanilla bean was split down the middle and scraped of its insides (wow, that sounds awfully violent, doesn’t it?) and blended with some melted butter and local Orange Blossom Honey. 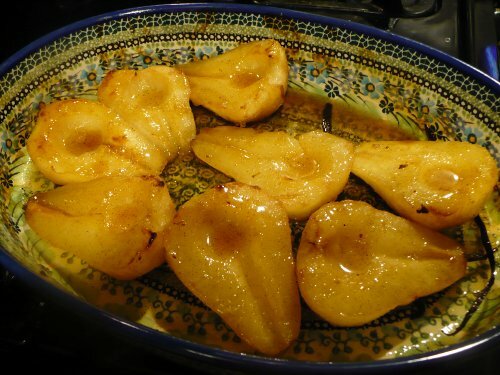 After the pears took a little bath in this magical syrup, they were nestled in one of my favorite roasting dishes and put in the oven for an hour. And I’m not joking when I tell you these smelled amazing when they came out of the oven. The pears with the honey, vanilla and a splash of lemon just works. What’s fantastic is that the juices mix with the syrup and caramelize into this sauce you could pretty much wear as a perfume. It’s so simple, but one of these guys with a spoonful of whipped crème fraiche and a handful of fresh raspberries… okay, words don’t do it justice. I admit: not the greatest picture. 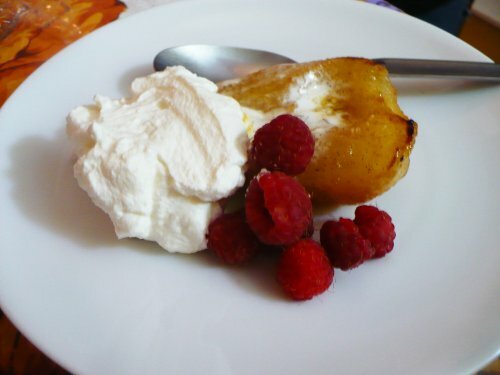 Not gonna apologize for it, either–that pear was warm, the crème fraiche was melting, and I needed to PUT IT IN MY MOUTH. Split vanilla bean and scrape seeds. Add seeds to a small saucepan with the honey, butter, lemon juice and melt on low heat until butter has melted and created a syrup. Tuck the remaining vanilla bean with the pears, pour syrup over the pears, making sure some of the syrup is in the core of each pear. 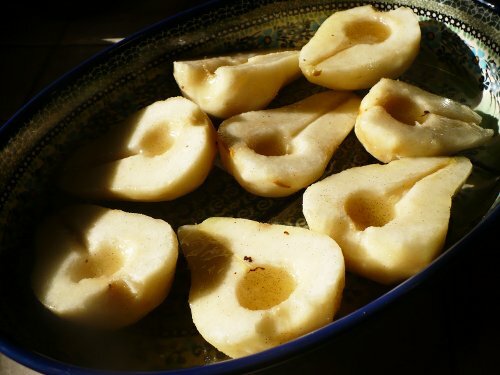 Roast for about 30 minutes, then turn over and roast another 20-30 minutes until the pears are fork-tender. Turn the pears cut side up again, and brush juices over the tops. If you’d like a little extra browning like I did, turn broiler on low and broil the tops for 3-5 minutes. Serve warm with whipped crème fraiche or if you’re feeling decadent, some great vanilla ice cream. A Paradigm Shift at Braise, Boil, Bake and… Oh Look! Bacon! I know I’ve been rather quiet here on BBB this year, for a multitude of reasons which I won’t bore you with all the details except for the major one: the complete change of how my family eats, especially since the beginning of this year. We’ve moved to eating in a primal/paleo fashion. You may have heard of it–it’s gaining followers, and for good reason, I believe. I’m not going to preach about it, but if you’re curious, you can learn more about it at the Whole9 Blog and Mark’s Daily Apple to just start out. Essentially, we’ve cut things out of our diets such as grains, legumes and heavily processed foods; and began focusing our diets on meat, poultry, fish, eggs, vegetables, healthy fats such as coconut oil and things like fruit, full-fat dairy and nuts in moderation. Sure, we’re not perfect–we do go off the rails sometimes for holidays or when we’re traveling–but we figure we always do the best we can, and our bodies do like to remind us when we’ve cheated enough. It’s really been an incredible change for us. I’ve lost 80 pounds and have seen many of my health markers change for the better: my A1C, cholesterol and liver function numbers went to normal within 6 months of starting the diet–I sleep better and I have the energy to get through my day (with exercise, even!). Choo has been on this also, and he’s lost somewhere to the tune of 50 pounds. Oh sure, it’s BACON. But, even with fat not being the enemy in a paleo diet, if you’re using cured bacon, it still needs to be treated like it’s candy: sweet, delicious meat candy. Still, these make a fantastic appetizer, especially right now while figs are at the height of their season. These are super-easy but still impressive (don’t you love it when that happens?). Heat your broiler on low and cover a sheet pan with foil. 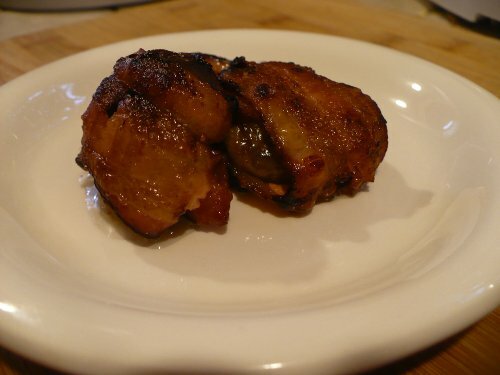 Slice figs in half lengthwise and cut bacon slices in half. Place sheet pan in oven on the top rack setting, broiling figs about 7-9 minutes on each side, depending on how crisp you like your bacon. Fight the urge to immediately pop one in your mouth the minute they come out of the oven. 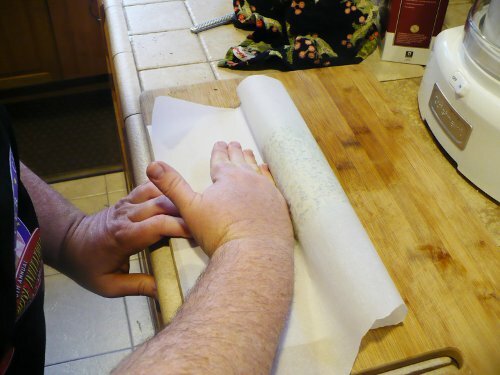 It’s been a busy few months (May is always one of my craziest months), but now that Kiddo is out of school, I can finally take a deep breath and… get back into the kitchen. What better to do than jump in and do several days of baking? Trust me, it’s for a good cause: charity! The adorable ladies of Run Around Betties are hosting a bake sale on Sunday, June 26th with all the proceeds going Share Our Strength which goes to ending childhood hunger in America. And if you’ve been around for a while, you know I love a good excuse to get my sugar on. I bet you want to know what put together for the sale, don’t you? Not pictured: handmade waffle cones in Chocolate, Peanut Butter, Brown Sugar & Cinnamon and Caramel. 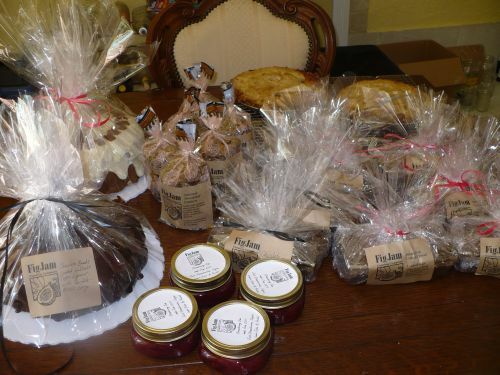 So if any of these tempt you and you’re in the area, look for the girls in polka dots at 4380 Ventura Canyon in Sherman Oaks from 10 AM to 2 PM and get some goodies for a good cause!